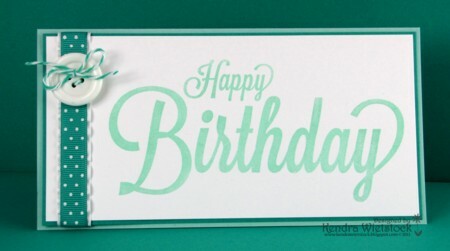 Here's a fun card using a Coverall background stamp by Gourmet Rubber Stamps called Birthday Squared. Here's how I inked it up... talk about EASY PEASY!!! Happy New Year to all my fun crafty peeps ~ thanks for always brightening my day with your lovely comments. Twenty-twelve has been such a great year & I'm looking forward to more amazing times in 2013. Yes...I'm still here! 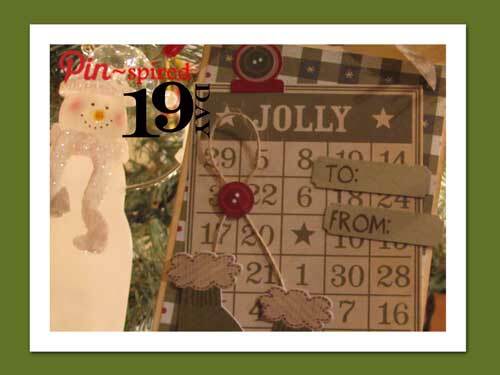 My "Pin-Spired" Christmas posts ended just in time for Christmas & my family being home...so creating anything new was put on the back burner for a few days. Now I'm busy creating again, but I can't share just yet because it's for CHA & a new release. I have some exciting news to share in a few days..so hang tight! 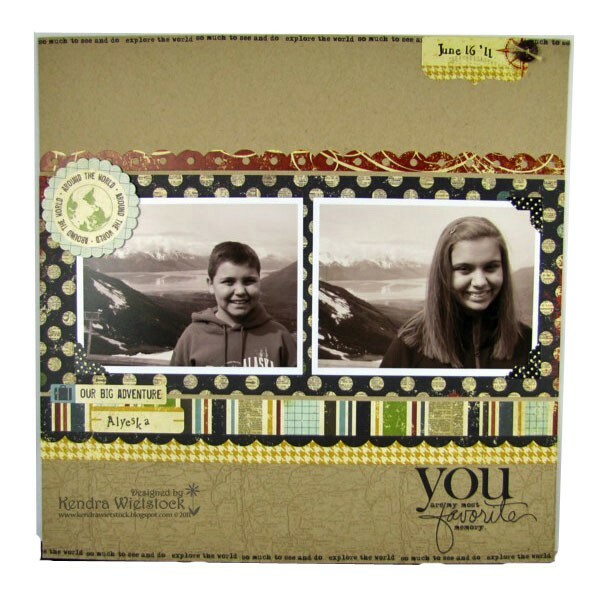 So rather than a new project today, I wanted to share some of my favorite projects for Twenty-Twelve! Here they are ... in no particular order! #1: The pages from my Alaska Project...which I'm still working on by the way! I love this page & picked it as my favorite from the bunch. 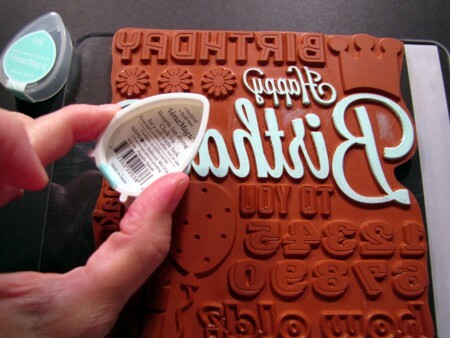 #2: From Gourmet Rubber Stamps using the March Diners Club set. #5: My Fabulous Girl ~ I used Unity Stamps for this pretty page. 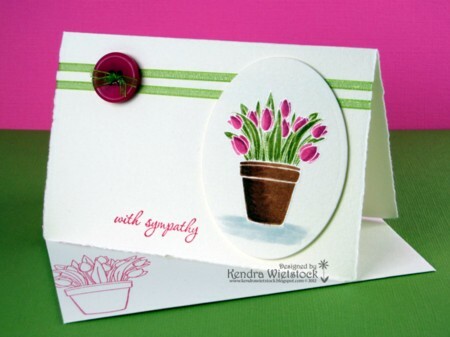 #6: I loved how this flower pot of tulips turned out with my Gourmet Rubber Stamps. #7: A big accomplishment for me this year was losing 45 lbs...I had to document it on this page using stamps from Our Craft Lounge. 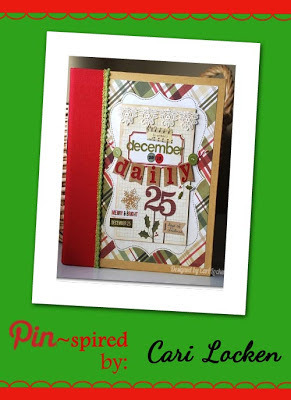 #8: I just love my entire December Daily Album. I'm still working on finishing this up...but I love how it has turned out so far. 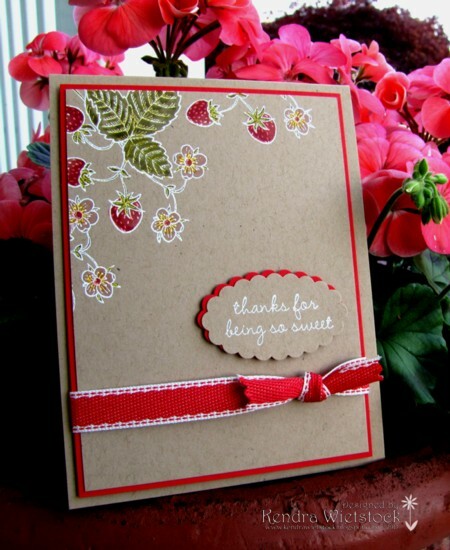 #9: I adore this strawberry card using my Gourmet Rubber Stamps ~ anything goes with kraft cardstock! 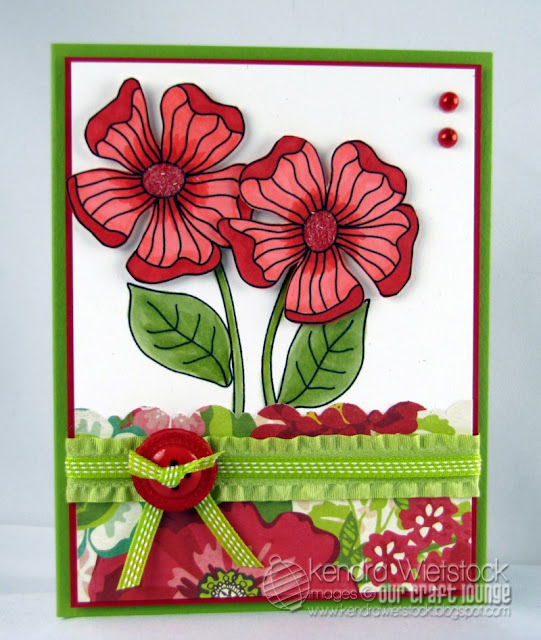 #10: This special birthday card uses the Pretty Petals stamp set from Our Craft Lounge. 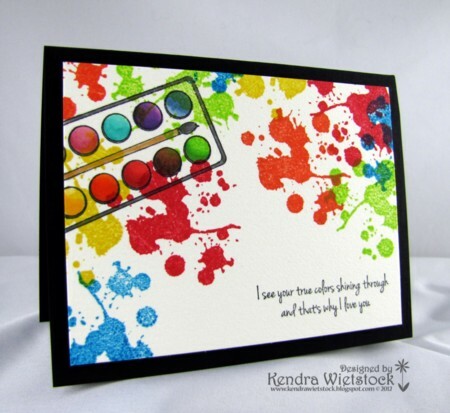 #11: I remember squealing with delight when I finished this card using Color My World from Gourmet Rubber Stamps. 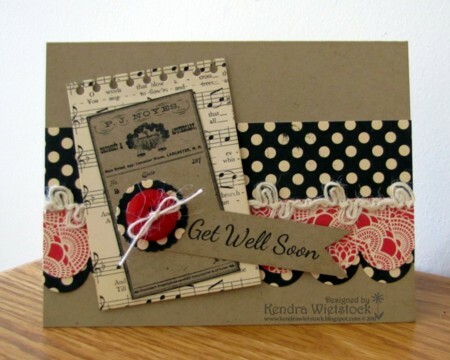 #12: I just love the layout of this card...so simple but I love it. The stamps are from Gourmet Rubber Stamps. Please email me with your contact information and I'll mail out some crafty goodies to you! Remember you have until 12/31/12 to send me your contact information. Thanks everyone for playing along this month! I had such a great time getting into the Christmas spirit this year! I needed a gift for an event yesterday, so I decided to play along on the challenge at the same time. I wrapped the gift in kraft packing paper, tied a felt ribbon around it and then stamped the flourish from Peace & Love Flowers Appetizer Set. I love how simple it turned out. Then I used the cool flower from the same set on the card along with the sentiment from Perfect Phrases. 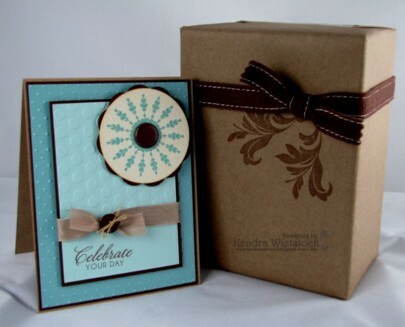 Two different polka-dot embossing folders add some great texture to the card. Last Day of my "Pin-Spired" Christmas! 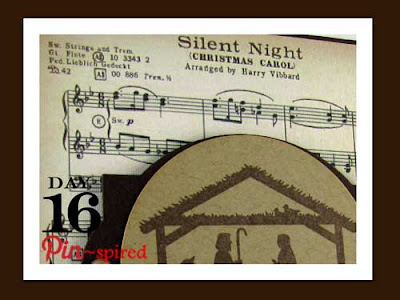 Well...today is my last day of my "Pin-Spired" Christmas Celebration. I've had a lot of fun making projects based on the things I've been pinning over the last several months. It's been great to actually use ideas that I've seen! Whew...are ya still with me??? I still have 8 more pages to finish in my album, but I know I won't have any issues completing it for this year. While this was a super fun project, not sure I'll need to do one each and every year. Today my "Pin-spired" friend is Daisy Sparks! 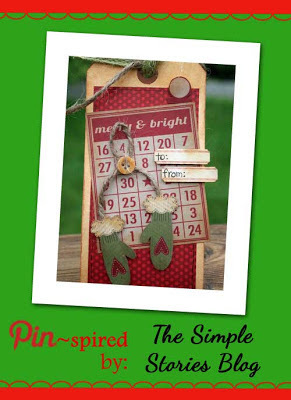 So please hop on over to her blog and see what she came up with for her "Pin-spired" project! Thank you Daisy and all of my sweet friends for playing along so much this month ~ your projects have all been fabulous! Blog Candy! I will be drawing random comments from my blog and will give away some cool blog candy. You may leave as many comments as you'd like through the end of today. I will announce the lucky winners here on my blog within the next few days. Blog Candy Rules: Comments that I deem unkind or look like spam will be deleted. Winners will be posted on my blog each Saturday and must send me an email with your contact information. Deadline for final blog candy drawing will be midnight (ET) on December 21, 2012. If you fail to provide contact information to me by December 31, 2012, prizes will be forfeited. 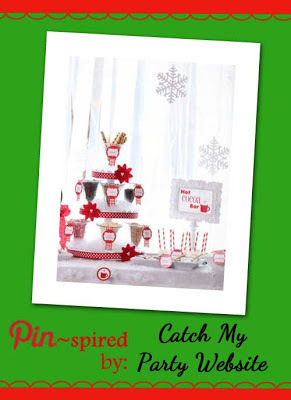 I hope you've enjoyed my "Pin-Spired" Christmas Celebration as much as I've enjoyed bringing it to you. Have a VERY Merry Christmas & a Blessed New Year! For today's project, I decided to use bits and pieces of pattern paper scraps from Lily Bee Designs that I had laying around. Super cute tree huh? 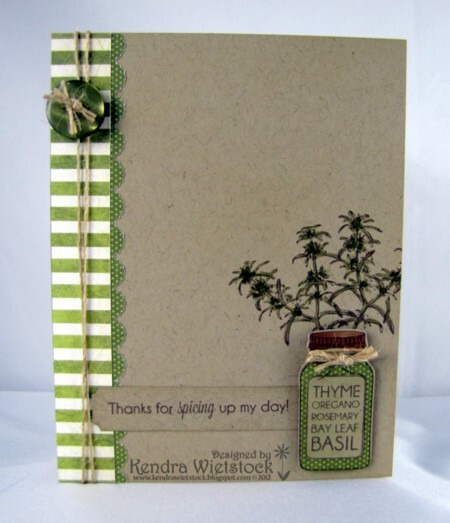 I also used the "Happy Holidays" sentiment from Gourmet Rubber Stamps. Today my "Pin-spired" friend is Melissa Cash. 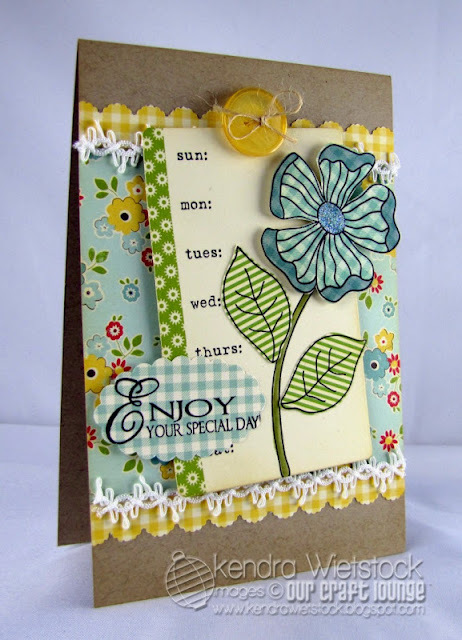 So hop on over to her blog and see what she came up with for her"Pin-spired" project! Don't forget ~ Weekly Blog Candy! Each Friday I will be drawing a random comment from my blog to give away some cool blog candy. You may leave as many comments as you'd like each week. Then at the end of my "Pin-Spired" Celebration, I'll have more prizes to share with more lucky winners! See you tomorrow for my last day of "Pin-spired" fun. 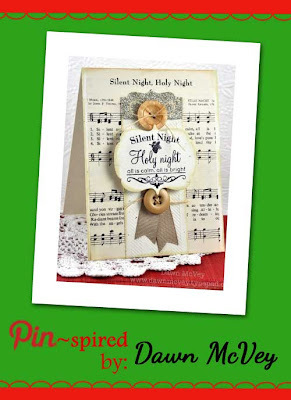 Back on Day #5, I showed a cute tag using the Simple Stories Handmade Christmas collection. I thought it was so cute that I decided to make a few more for my packages. Speaking of that...I really need to wrap gifts! Today I have three returning "Pin-spired" friends joining me ~ Vicki Garrett, Daisy Sparks and Debbie Corbari. 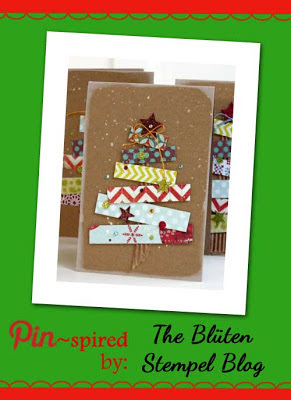 So hop on over to their blogs and see what they came up with for their "Pin-spired" projects! Weekly Blog Candy! Each Friday evening I will be drawing a random comment from my blog to give away some cool blog candy. You may leave as many comments as you'd like each week. Then at the end of my "Pin-Spired" Celebration this weekend, I'll have more prizes to share for more lucky winners! 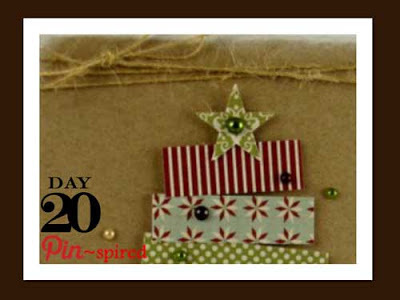 See you tomorrow for more "Pin-spired" fun ~ only 2 more days! I had so much fun yesterday making this delivery to the music department at our high school. Concord Community Schools has one of the most amazing music programs around and the directors & staff are all fantastic. Both of my kids have found their special "spot" at school because of this program...so it holds a special place in my heart. For this reason, I wanted to share this fun Christmas treat with the amazing directors and staff... a Hot Cocoa Bar. I found 6 different "mix-ins" for their cocoa ~ white chocolate chips, peppermint chips, mini marshmallows, chocolate caramel candies, mini chocolate chips and mini peanut butter cups. Then added these yummy round cookies in the middle. I printed up labels on the computer and then punched them out and added them to the cups so they would be able to identify them. Next I added a tin of various types of cocoa ~ gourmet cocoa, french vanilla, raspberry, mint and peppermint. I also added a few packets of spiced cider just in case someone doesn't like chocolate. 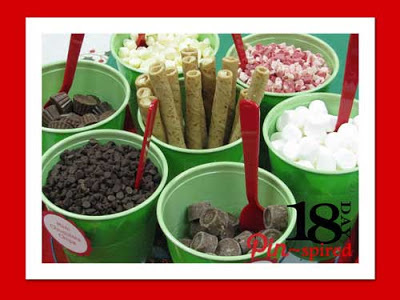 Here is a tray of chocolate dipped peppermint sticks and spoons for stirring their yummy concoction. I bagged each one so they could take one home if they wanted. 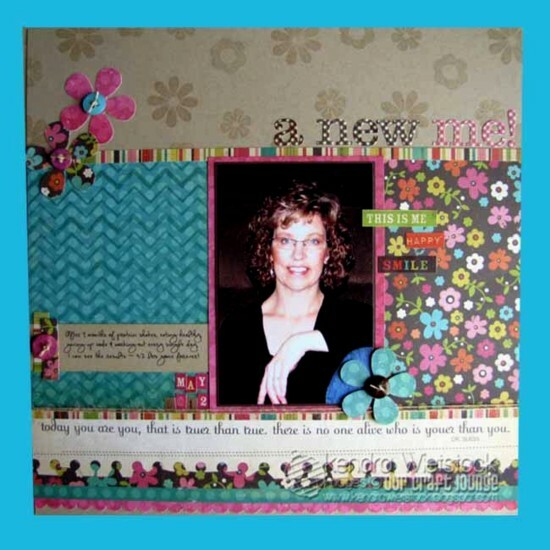 Today my "Pin-spired" friend is ~ Broni Holcombe. So hop on over to her blog and see what she came up with for as a "Pin-spired" project! WOW ~ The days are really winding down to my "Pin-spired" celebration! Just 3 posts left! Hope you are enjoying the fun! Monday is here again and here we are just a week from Christmas. 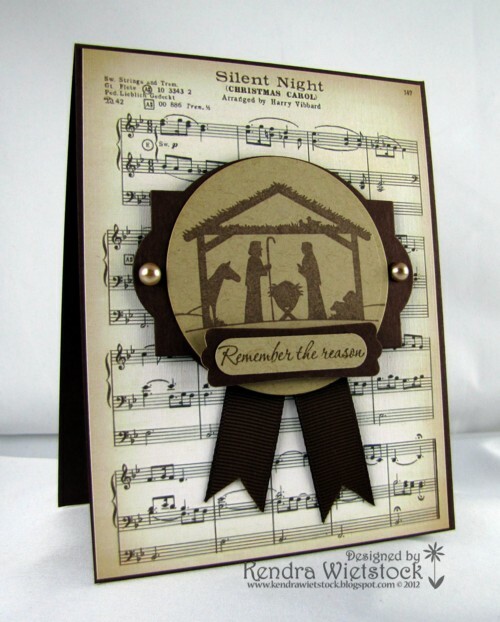 I found this lovely card on Pinterest several weeks ago just knew I had to recreate it with a few of my stamps from Gourmet Rubber Stamps. I used the Pine Tree single along with the Peace on Earth sentiment single. I used some shimmery white cardstock that I had in my stash and stamped my tree on it with white pigment ink and then embossed it with white embossing powder. I used my brayer and rolled blue ink over the top of the image. WOW ~ it's been FOREVER since I got my brayer out! I just took a dry cloth and wiped off the ink from the tree and then I added a blue pearl to the top of the tree. I used a snowflake embossing folder on the white shimmery cardstock for the background and added the beautiful blue bow for a finishing touch. 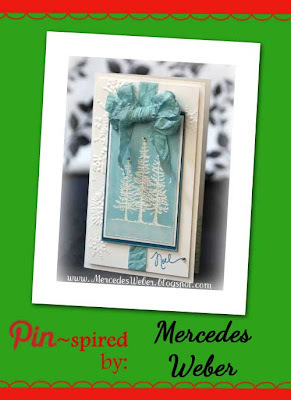 The sentiment is stamped in the blue ink and I added a few smaller blue pearls to the swirls. I really love how this card turned out & it super sparkly in real life with the white shimmer paper. Today I have two returning "Pin-spired" friends ~ Debbie Fisher & Daisy Sparks and one new friend ~ Charmaine Ikach. So hop on over to their blogs and see what they came up with for their "Pin-spired" projects! Don't forget ~ Weekly Blog Candy! Each Friday evening I will be drawing a random comment from my blog to give away some cool blog candy. You may leave as many comments as you'd like each week. Then at the end of my "Pin-Spired" Celebration, I'll have more prizes to share with more lucky winners! 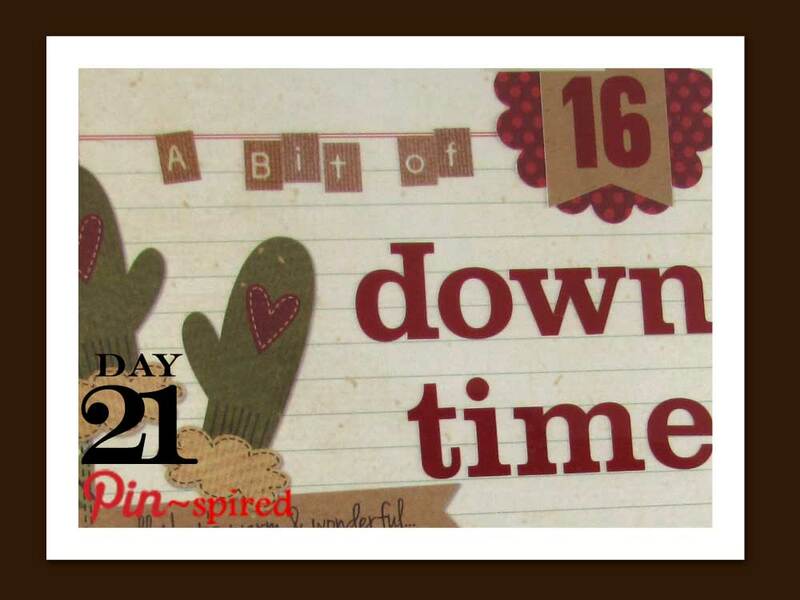 See you tomorrow for more "Pin-spired" fun! What an inspiring card! Just started following you...you are incredibly talented! Thank you for the lovely compliment and for hopping along with us. Please email your contact information to me & I'll get your prize in the mail! Once again, today I have TWO things going on... Not only am I continuing with my "Pin-spired" Christmas celebration, but the Gourmet Rubber Stamps girls are having a Christmas Blog Hop and each of us are giving away a GRS stamp set. The set I used for my card again today is called Silent Night. I didn't have any music pattern paper with the song Silent Night, so I found the image on the internet and printed it on my color printer. EASY PEASY! In addition to the GRS Christmas Blog Hop, I will continue with my Weekly Blog Candy! Each Friday I will be drawing a random comment from my blog to give away some cool blog candy. You may leave as many comments as you'd like each week. Then at the end of my "Pin-Spired" Celebration, I'll have more prizes to share with more lucky winners! 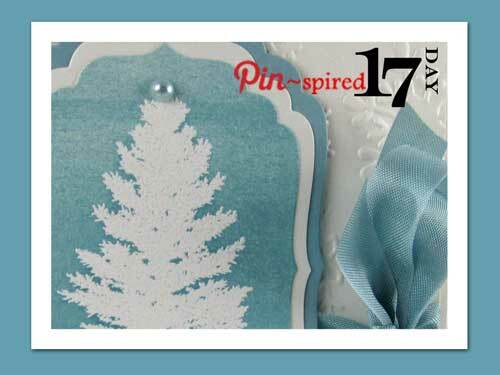 See you tomorrow for more "Pin-spired" fun. 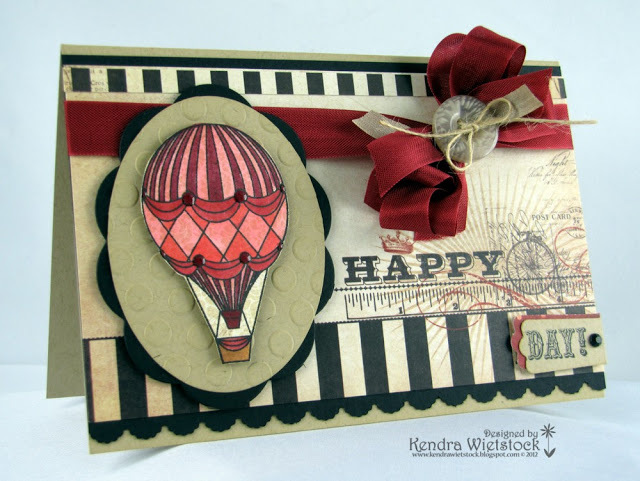 GRS Sketch Challenge & "Pin-Spired" Day #10!